Boston Roofing and Gutters serving Boston and The Greater Boston Area, Metro West, North Shore, South Shore, Hoboken New Jersey and The Heights New Jersey. Boston Roofing and Gutters is the best roofing contractor in Massachusetts and New Jersey, offering a variety of services including: roof installation, roof repairs, chimney cleaning and repair, gutters installation, gutter repairs, gutters cleaning, siding installation, siding repair. Boston Roofing and Gutters primary goal is to provide our valued customers with the highest standard of craftsmanship, while tailoring to their precise needs in a professional and timely manner. Boston Roofing And Gutters LLC is the first company to offer GutterArt to the Boston Market. Call us now and ask for more details on how to add that amazing feature to your home project. Did you know that you can schedule maintenance on your gutters and not worry about them ever again? You choose the the type of maintenance and we will do the job just like we've done it a million times before at the specific date and time you are comfortable with. Valid for all customers. Date and time have to be no earlier then a month from today. This is not a special offer, it is an effort to make the process of maintaining a house less stressful and time-consuming. 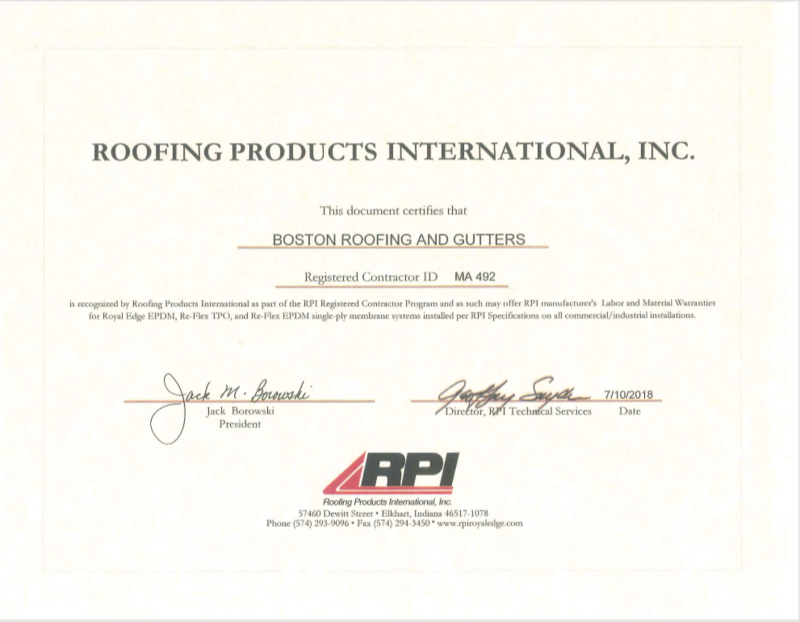 Boston Roofing and Gutters is recognized by Roofing Products International as part of the RPI Registered Contractor Program and as such may offer RPI manufacturer's Labor and Material Warranties for Royal Edge EPDM, RE-Flex TPO, and Re-Flex EPDM single-py membrane systems installed per RPI Specifications on all commercial / industrial installations. I want to thank Boston Roofing and Gutters for doing such an amazing job installing a brand new Gutter system onto my house. The employee that came out to my house to give me a quote was very knowledgeable, courteous, and patient(i had mass save at the house as well). I was given the step by step process and told that due to my roofs edges, i would need wedges placed along the house in order to correctly install the gutters. The company came out within the week, did the work in a day, and left no trash behind. The work looks phenomenal and my flower beds will be happy they aren't being drowned by rain fall anymore! Chris and his team are very capable. They did a lovely job patching our roof and replacing our gutters. It also slipped my mind to tell one of my neighbors about the roof work and he was able to sort out the use of my neighbor's yard. I would use him again! Called the office to replace the roof covering on my front porch and scheduled an appointment with Ian.He was very polite and explained all the steps needed to get the job done up to code.I had a new roof put in by Boston Gutters within a week of the initttial contact.They took care of all dumbsters and permits needed and job went great.